We had not intended to make today such a long day but things conspired against us and we ended up cycling for 13 hours again. 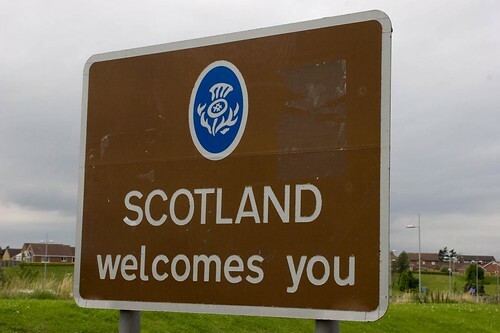 We did pass a big landmark today, as the image shows below, we made it to Scotland. 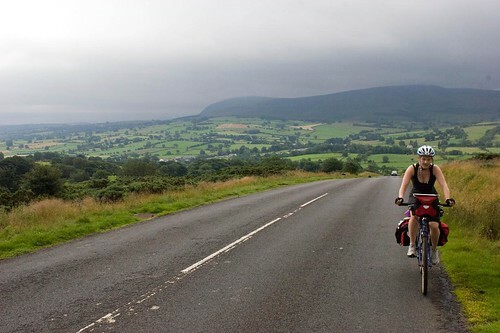 I also set a new top speed record for the trip, beating Pete by hitting 45.5mph – bloody scary on a fully loaded bike! Hasket Newmarket was lovely and the cycle ride up to Dalston for breakfast was very pleasant. We had cereal and fruit for a change, leaving the full English aside. From Dalston, we went via Carlisle, a super- grim town after the beauty of the Lakes. Things got a little tricky thereafter, as we cycled on B roads that run parallel to the M6 motorway. Our plans came undone when the road ran out, with only the motorway as an option. There was a lot of construction going on, so we decided to cycle through the road works, along the M6. Things went well until we were stopped by the Foreman. He gave us an earful about the safety aspect and that we should go back and around (a 12 mile detour). He fortunately relented and allowed us through, over the border and into Scotland. As soon as we crossed the border, the weather turned foul and started to drizzle. We had to join the A75, a dual carriageway from Gretna to Dumfries. Fortunately, Mary had an alternative plan and we hopped onto a minor road, which was far more pleasant. We were about 5 miles outside Dumfries when the skies opened and we were all completely soaked. As we rolled into Dumfries, we were unsure whether to press on or stop and dry off. Our decision was made for us by the fact that there was nowhere safe for us to leave the bikes, so we bought some food and headed to the tourist office. Here, we bought a map of Scotland and talked to the guys there about where we should head to. They recommended a place called St Johns. Unfortunately, this meant getting back on the dual carriageway and cycling in the rain. All of us were cold, tired and fed up of the busy roads. All of this changed once we got off the A roads. 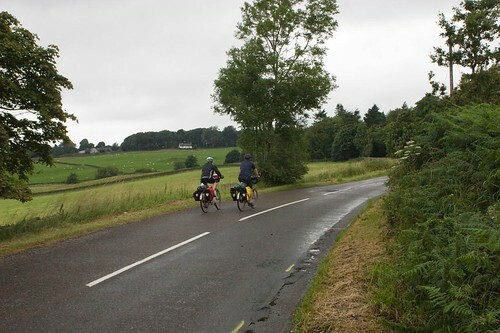 We were fortunate enough to cycle a wet but gorgeous road, another top 5 road for the trip for me. The biggest blow of the day came when we got to St Johns. All of the hostels, hotels and B&Bs were booked out, including some rancid Scottish woman who lied through her teeth saying one moment that she had room and suddenly changing her mind the next. What really galled us was that she said there was a YHA hostel 10 miles up the road, in the middle of nowhere. We were cold, tired and hungry and really not in the mood for this crap. Our early impressions of Scotland were somewhat saved from complete damnation when we eventually arrived at the hostel. We were greeted by some really friendly people, given great rooms with incredible views and then food by the other people present. Overall, a very long day indeed that ended really rather well.